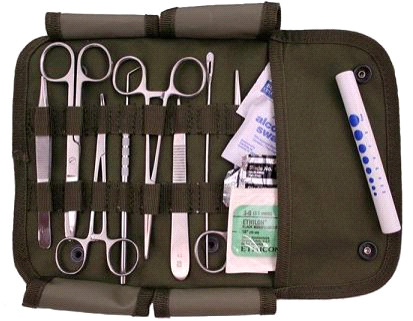 Fully Stocked Medic Surgical Set MOLLE Nylon Bag. This is the model 80122. This Surgical Set contains all stainless steel instruments. NOTE: Contents of the Surgical Set are not sterile. 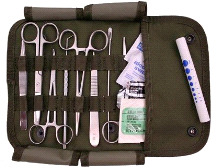 The Surgical Set comes sealed in a plactic pouch with a list of contents. The Surgical Set weights 0.7 lbs. 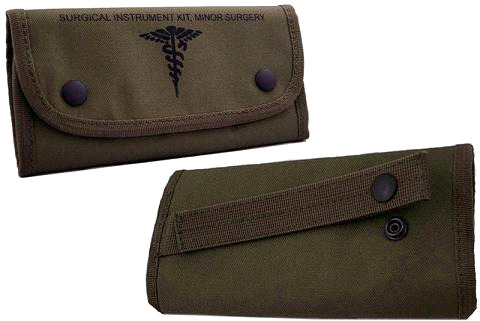 and is available in a codura nylon OD pouch, which has a M.O.L.L.E. strap. We stand behind every item that we sell with our 100% guarantee, if you have any questions please give us a call at (800)355-2956.